Making sense of the eurozone crisis. Continuing problems in the eurozone and slowing global growth are making for volatile markets. Is a solution in sight or should investors be prepared for protracted period of uncertainty? 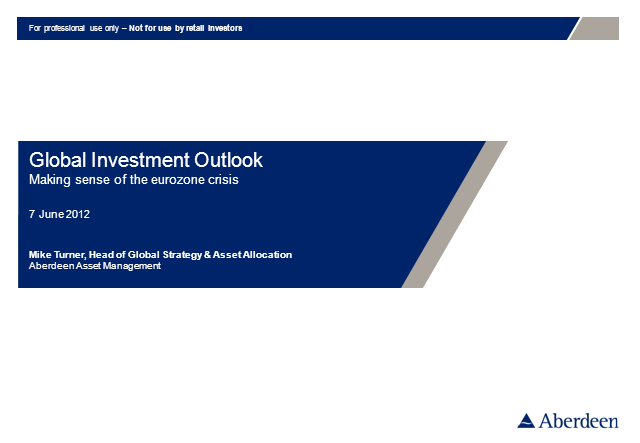 In this live webconference, Aberdeen’s Head of Global Strategy & Asset Allocation Mike Turner will analyse the eurozone crisis and discuss the outlook for global investing. Mike will be joined by managers from Aberdeen’s equities, fixed income, solutions and property teams, who will discuss the opportunities they see within their markets.